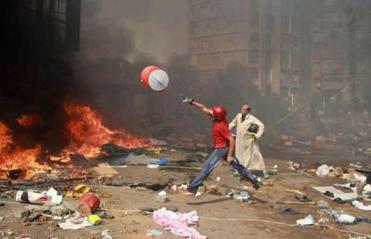 Supporters of ousted president Mohammed Morsi ran from Egyptian security forces in Cairo’s Nasr City district. 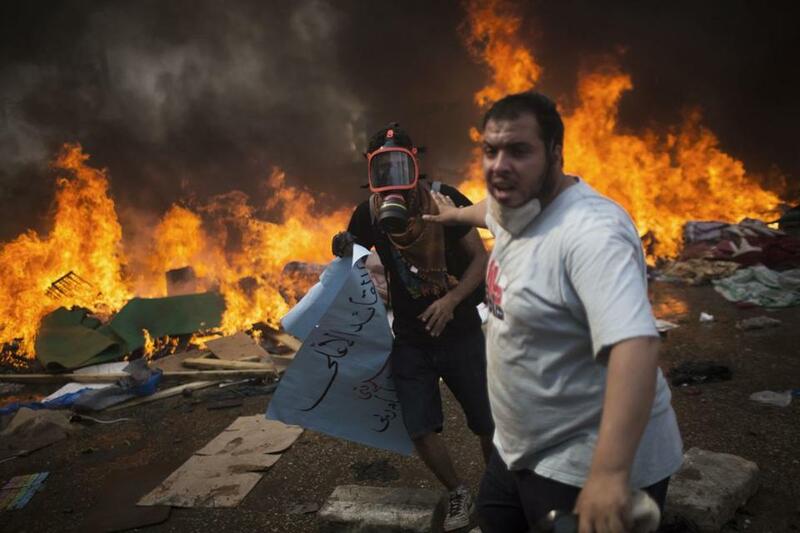 CAIRO — Security forces killed more than 200 protesters and wounded hundreds of others Wednesday in a daylong assault on two sit-ins by Islamist supporters of the ousted president, Mohammed Morsi, that set off waves of violence in Cairo and across the country. By afternoon, the interim government appointed by General Abdel-Fattah el-Sissi had declared a one-month state of emergency across the country, suspending the right to a trial or due process. The declaration returned Egypt to the state of virtual martial law that prevailed for three decades under former president Hosni Mubarak before he was forced to step down in 2011. Mohamed ElBaradei, the interim vice president and a Nobel Prize-winning former diplomat who had lent his reputation to convincing the West of the military-appointed government’s democratic intentions, resigned in protest, a spokeswoman said. By evening, the Egyptian Health Ministry said 235 civilians had been killed, and the Interior Ministry said 43 police officers had been killed. The number of injured was put at 900. But the large number of dead and critically injured Egyptians moving through various makeshift field hospitals in Cairo indicated that the final death toll would climb much higher. At least one protester was burned alive in his tent. Many others were shot in the head and chest. Some of the dead appeared to be in their early teens, and young women assisting in a field hospital had stains on the hems of their abayas from the pools of blood on the floor. The government imposed a 7 p.m. curfew across much of the country. Clashes and gunfire broke out even in well-heeled precincts of Cairo far from the sit-ins, and by the afternoon streets across the city were deserted. Outside Cairo, mobs of Islamists attacked a police station in the Giza governorate, burned down at least two churches in rural southern Egypt, and raged through the streets of Alexandria and other cities. The scale and brutality of the attack — with armored vehicles, bulldozers, tear gas, snipers, and live ammunition — appeared to extinguish any hope of a political reconciliation that might persuade Morsi’s supporters to participate in a renewed democratic process under the auspices of the military-appointed government. Instead, the crackdown was the clearest sign yet that the old Egyptian police state was re-emerging in full force, defying the protests of liberal members of the interim Cabinet, Western threats of a cutoff of aid or loans, and the risk of a prolonged backlash of violence by Islamists angry about the theft of their democratic victories. It was a level of violence that might have crushed the January 2011 uprising that ousted Mubarak if military and police forces had unleashed it at that time, although back then the security forces faced a broader spectrum of protesters before the struggles over the political transition divided the Islamists and their opponents. Tens of thousands of Morsi supporters had moved into the protest camps, many with their families. The dead included the 17-year-old daughter of a prominent Islamist lawmaker in the dissolved Parliament, Mohamed el-Beltagy. As for the US threats to cut off aid or block international loans, Shahin said no Egyptians ever took them seriously. A spokesman for President Obama said the United States was continuing to review the $1.5 billion in aid it gives Egypt.The spokesman, Josh Earnest, said the violence runs directly counter to pledges from the interim government to pursue reconciliation. The attack began about 7 a.m. when a circle of police officers began firing tear gas at the protest camps and plowing down tents with bulldozers. The Egyptian Interior Ministry had said it planned to choke off the protests gradually, first by cutting off supplies, blocking new entry to the sites, and leaving one safe exit for those who sought to leave. But by about 8 a.m., the smaller sit-in, near Cairo University, had been demolished in a cloud of tear gas. At the larger sit-in, near the Rabaa al-Adawiya mosque, several thousand protesters appeared to be trapped inside with no safe exit as snipers fired down on those attempting to flee, and riot police officers with tear gas closed in from all sides. There was no evidence that the Islamists had stockpiled weapons inside the encampment, as Egyptian state media had claimed. Instead, Islamists converging on Rabaa from around Cairo hurriedly broke pavement into rocks or mixed Molotov cocktails for hurling at the police. A few were armed with makeshift clubs, or sought to use garbage pail lids as shields. For a time in the late afternoon, the Islamists succeeded in pushing the police back far enough to create an almost safe passage to a hospital building on the edge of what remained of their camp. They had moved cars into place as fortifications, and two long rows of men were passing stones hand to hand to try to build new barricades. The passage was safe except for a roughly 20-yard stretch in front of the hospital doors, where snipers fired down from both sides. A series of Islamist marchers from around the city were able to enter the encampment, bolstering its numbers even as the shooting continued. But shortly before dusk, soldiers and police officers launched a renewed push, seizing control of the hospital and tearing down the last tents and central stage erected at the core of the camp. The protesters had nowhere left to hide, said Morad Ali, a Muslim Brotherhood spokesman who had been inside the camp, and they were forced at last to flee.